Monday November 5, 2018-Former Kakamega Senator, Boni Khalwale, on Sunday reached out to Deputy President William Ruto to pick his 2022 running mate from the Western region. Speaking during a rally in Kakamega where Ruto had made a stopover in preparation for his tour of South Nyanza, Khalwale urged Ruto to settle on either ANC leader, Musalia Mudavadi, or Bungoma Senator, Moses Wetangula,as running mate. 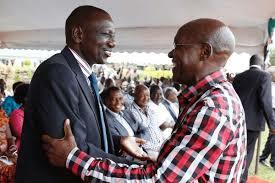 “Pick your running mate from Western,” Khalwale stated. Sports Cabinet Secretary, Rashid Echesa, who accompanied the DP, explained that he had pleaded with both Wetangula and Mudavadi to join the Ruto bandwagon to no avail. "I again asked them to join Ruto for 2022 elections, but again they became sluggish. Now Odinga has joined the Government before them,” he said.